Mrs. Silence J. Soule penned the following words . . . I have observed that old people live much in the past. As I grow older I find myself turning oftener to the days in the old home. I hear the patter and the prattle of childish feet and voice ; light step of youth and maid; sober footfall and serious word of man and matron; the slowing step and failing voice of age. All, all are gone! I alone am left of . . . The fitful firelight paled and shone. The voices of that hearth are still. Of life and love to still live on. The version linked here is dedicated as follows . . .
On this date in our family history . . . the 3rd day of November . . . in the year 1816 . . . Mahala Lee Roberts is born in Washington Parish, Louisiana . . . she is the 7th of nine children known to have been born to Elisha Roberts and Patsy Gill . . .
By 1830, Mahala is living in San Augustine County, Texas with her parents and siblings . . . in 1833 her father signs his name to a document establishing the town of San Augustine . . . in 1836 Mahala marries John M. Sharp in San Augustine County . . . and at least two children will be born to them . . . Samuel Houston Sharp and Margaret Sharp . . . John Sharp is presumed to have died before 1846 . . . In 1851, Mahala marries Joshua James Hall in San Augustine County . . . and they have at least two children . . . Roberta Hall and Toby Hall . . .
On Mahala's 53rd birthday . . . the 3rd day of November . . . in the year 1869 . . . Mahala's granddaughter, Margaret Elizabeth Sharp, is born in Liberty County, Texas . . . another two years later . . . on the 3rd day of November . . . in the year 1871 . . . another granddaughter, Ida Mae Sharp, is born in Houston County, Texas . 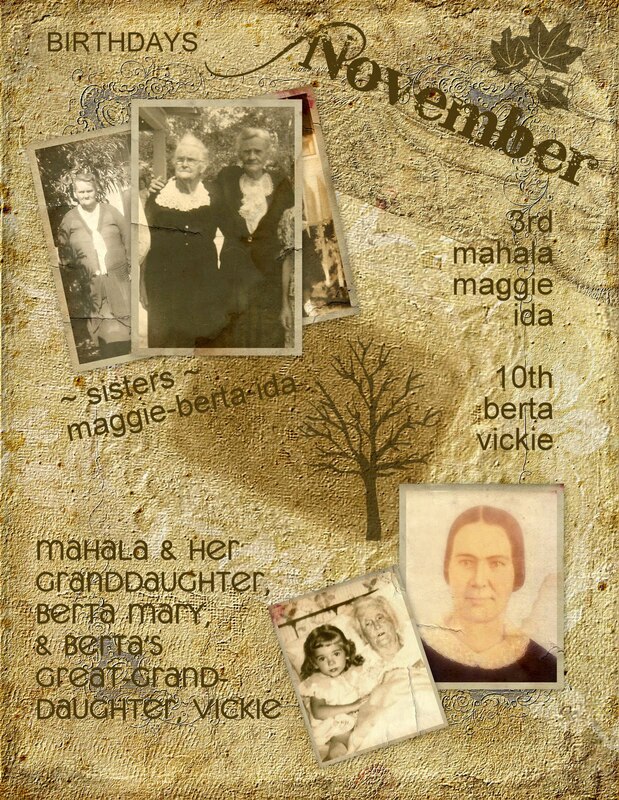 . . Mahala would live to share another thirteen birthdays with these two granddaughters before her death in June of 1885 . . .
We are blessed to have access to a portrait of our Mahala . . . as well as photos of some of her grandchildren . . . the little one in the collage is a four-year-old version of the Keeper of this family history blog . . . in the arms of her great-grandma, Berta Mary . . . Mahala was grandma to Berta Mary . . . and is a 3rd great-grandma to the four-year-old in the photo . . .
A hundred-year-old photograph stares out from a frame. And if you look real close you'll see our eyes are just the same. From the stories my dear grandma would tell. Every step I take they're watching over me. I might not know where I'm going but I'm sure where I come from. They're my Guardian Angels and I'm their special one. This blogpost containing poetry as well as song lyrics was researched and prepared specifically for The Fifth Annual Great Genealogy Poetry Challenge over at cousin Bill's blog which is known as . . . West in New England . . .
Love the post. The video is the cream. Thanks.